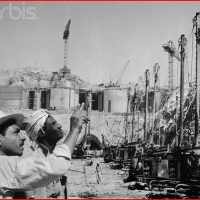 Following the overthrow of King Farouk in 1952, new president Gamal Abdel Nasser viewed a new, larger dam as politically and economically vital for Egypt. The United States, looking to counter Soviet influence in the Middle East, offered to finance the construction of a dam as well as provide arms shipments to Egypt, on the condition that the weapons be used only defensively and that the U.S. supervise all training. 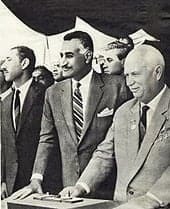 Nasser, attempting to keep Egypt independent from U.S. or Soviet influence as well as increase Egyptian regional clout, demurred. On September 27th, 1955, Nasser announced an arms deal with Czechoslovakia. This deal, along with Egypt’s diplomatic recognition of Communist China, angered Secretary of State John Foster Dulles, who saw Nasser as playing the United States and the Soviet Union against each other. On July 19, 1956, the State Department announced that the U.S. was withdrawing funding for the dam. 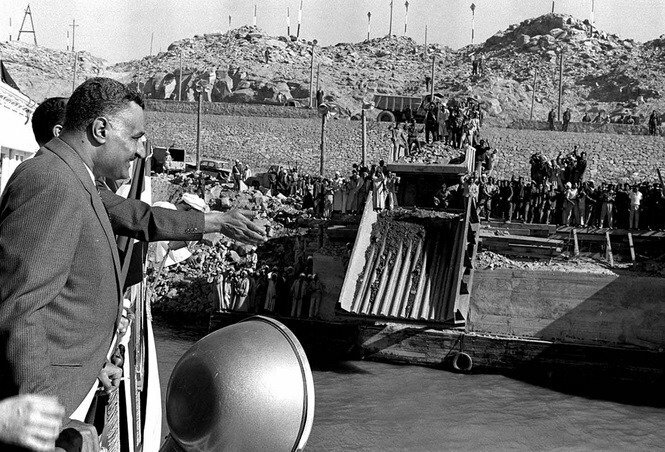 A week later, Nasser nationalized the Suez Canal, triggering a military response from Israel, Britain, and France. Dulles’ actions and behavior in regards to the Aswan Dam and lead-up to the Suez Crisis have long been scrutinized, many criticizing his impulsive decisions and prickly temperament. Others argue that Dulles was merely obeying Congress, who was concerned by the large amount of money committed and Nasser’s unpredictability. 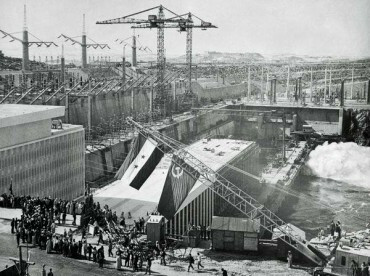 After the United States’ withdrawal of funding, Egypt turned to the Soviet Union for financial support for the Aswan Dam. 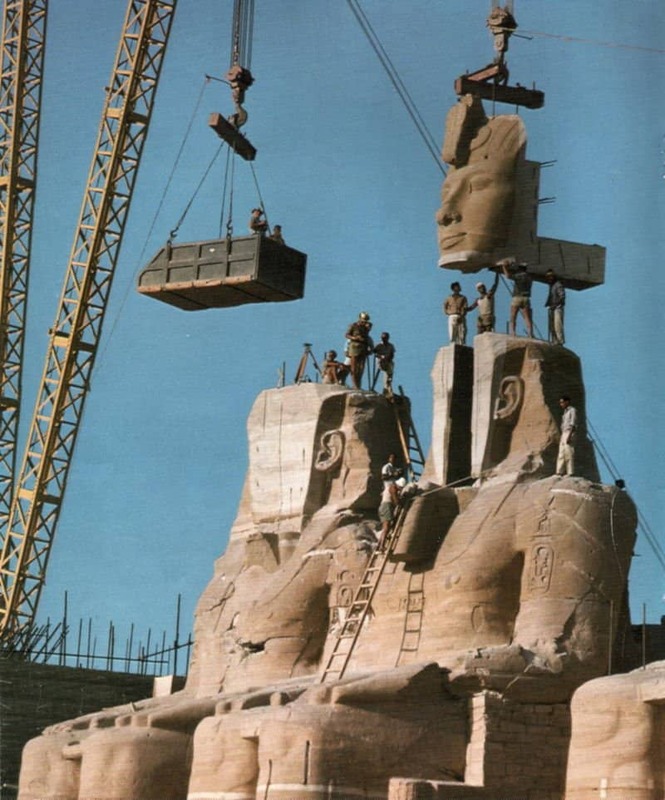 The dam’s construction forced the relocation of over 100,000 people and several ancient monuments, including the two massive temples of Abu Simbel, which were carefully dismantled and reassembled along the shore of the new reservoir, Lake Nasser. As Deputy Chief of Mission (DCM) in Cairo from 1955 to 1958, Parker T. Hart played a major role in negotiations over the Aswan Dam’s funding leading up to the Suez Crisis in 1956. Hart was interviewed by William R. Crawford beginning January 1989. James N. Cortada and John W. McDonald both served as Economic Officers in Cairo. Cortada observed Dulles and Nasser’s maneuvering over U.S. financial support, while McDonald witnessed the construction of the dam under Russian auspices a decade later. Both were interviewed by Charles Stuart Kennedy, Cortada beginning in September 1992, and McDonald in June 1997. Robert R. Bowie and Fraser Wilkins were both in Washington, D.C. during the lead-up to the Suez Crisis, Bowie as Head of Policy Planning, Wilkins as Director of Near Eastern Affairs. Wilkins was interviewed by Peter Jessup beginning in July 1988. Bowie was interviewed by Charles Stuart Kennedy on March 15th, 1988. Read more on the Suez Crisis and dealing with Nasser. Go here for other Moments on the Middle East. HART: The United States, with an engineering organization called Alexander Gibb, Boston, had drawn up plans…for the feasibility of a High Dam on the Nile above the old Aswân [Low] Dam [finished in 1902]. We had a kind of inroad there to start with. 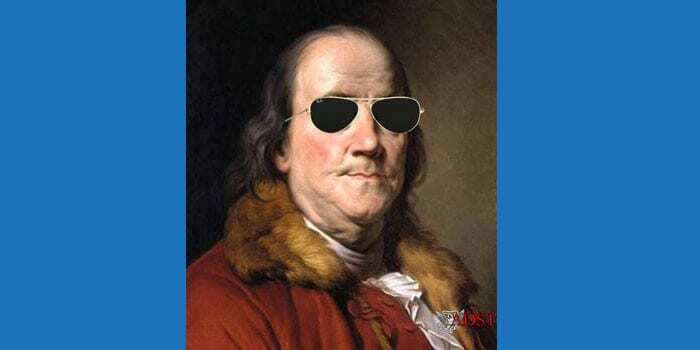 The British were very interested and, of course, we were sensitive to their sensitivity about taking over jobs and things that the British would normally have had in the past due to their preferred position in Egypt which was fading but it was still there in their minds. They wanted to make sure that they didn’t lose good contracts. It was an American-British proposition presented to the World Bank. Eugene Black was the head of the Bank. During this period we are discussing, which was late 1954 to early 1955, this thing was ripening up. It was known that the Egyptians who had come out of World War II with a wonderful foreign exchange position of some £400 million — good, hard, solid Egyptian pounds of those days, equivalent to British pounds, had really — through the spendthrift vagaries of [King] Farouk and the revolution — lost practically all of it. They were down flat. The question was how to finance this dam. Here I’ll have to do the best I can to resurrect my figures. It was thought that the dam would cost about £800 million to build, out of which about £400 million would have to come in the form of foreign exchange — hard currency — to pay for equipment, engineering skills, practically everything except the concrete and the hard labor which would be Egyptian. Black and the Egyptians were in discussion and, after the revolution of course, the head of all economic concerns in Egypt at the time was [Finance Minister] Abdul Mon’eim al Qaysuni, who was a Western-educated Egyptian, very sophisticated and a good economist. So you would divide $400 million into two parts and half would be grant. A major element of the grant portion of the $200 million would come from the United States, with a minor portion from Great Britain — as I recall it, 85% would be U.S. and 15% would be British. To start the program off, the United States was prepared to grant at once about $56 million and the British some fraction of their 15% — I can’t remember how much. Both U.S. and U.K. would require, for the purposes of making these grants and to cover their own parliamentary situation and practices, an undertaking by Egypt to not only use this money in the way it was supposed to be used but to make certain reforms in fiscal management in allocation of financial resources. The fiscal situation in Egypt was very confused. This meant some reforms concerning which the Bank had held discussions with Egypt. Qaysuni was sympathetic with this objective. Also — and this was a very key point — the American loan would be based upon a prior agreement in principle between the Sudan and Egypt with respect to the amount of Nile water to be stored by Egypt and how much was to be used by Egypt and how much would be reserved by the Sudan. In other words, a general international waters agreement would be required. Nasser didn’t like the Sudanese aspect at all. At this particular juncture you have to remember that this was late 1955. Sudan was still technically an Egyptian-British condominium, but actually was under British control. 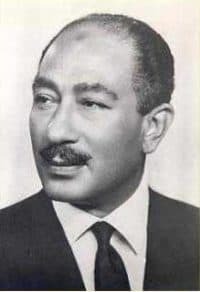 The Egyptian [foreign policy] under Nasser inherited a position on the Sudan which had been set by King Farouk: that the Sudan was really a part of Egypt and should be considered as poised to rejoin Egypt. Farouk, in fact, had proclaimed himself in October 1951 — before the revolution of July 1952 — King of Egypt and the Sudan. He did this while rejecting the Middle East Defense Agreement which the U.S. had proposed to Farouk’s Egypt, an agreement which would have brought Egypt into an association with, but not part of, NATO. Nasser didn’t like this idea of tying up Egypt’s commitments on water through the British. He’d be in a much stronger position if the Sudan were a part of Egypt. He could then dictate how the water problem should be handled. BOWIE: The Aswan dam proposal was one of the efforts to try to see if we could bring Nasser into a more cooperative relationship…This was a proposal that the United States, U.K. and the World Bank cooperate in providing the foreign financing, the foreign assistance, which was required for the building of a major dam on the Nile which would be both for irrigation and power. This was something that Nasser was very much interested in. It was going to be an enormous undertaking which required I think $1.3 billion, or something of that sort, of which a very large part had to come from domestic, internal resources of Egypt but of which I think $400 million had to come from outside, foreign exchange. And that’s what the U.S., U.K. and the World Bank were going to provide. This proposal came right after Nasser had made the deal for Czech arms, which really were Soviet arms, which of course was very upsetting to Western purposes in the area because it would raise problems then about the arming of Israel and so on. Still, in cooperation with the U.K., and really under pressure by the U.K., the U.S. and the Bank offered to finance this dam in December of ’55. Then negotiations took place over the coming months and Nasser tried to improve the conditions that were offered. And he also objected very much to some of the requirements that the Bank said it had to have in order to make certain that Egypt did in fact devote the resources that were going to be required to the completion of the dam, if it was built. Black gave me the text penciled and lined by Nasser, the things that Nasser would not accept. One blue-lined item concerned a prior agreement with the Sudan. This was very key. The other was the insistence on reform of his economic priorities in the various ministries to make sure that adequate money would be available throughout the project and that it was spent as it was supposed to. The press descended on Black as he came out of the office and he told them just that, but wouldn’t go into details. He went off thinking that there was a better than 50-50 chance for the project, something like an 85% chance perhaps, and he left. I wired, of course, the details of what he’d told me. It had a negative effect in Washington. There was silence for quite a while. [Minister of State Anwar] Sadat stood up and made one of his statements hostile toward the United States aid program. He liked to tee-off on our aid program to Egypt. He had already launched one broadside about our sending over a lot of poultry that turned out to have a respiratory disease. He said, “Instead of sending us weapons, they give us sick chickens.” This made good headlines in the Egyptian press, and Ros al-Yussuf and other publications had a good time with that, with caricatures. This time he went after us on something else — I don’t know what it was. He was pretty abusive. That turned people off in Washington. They had reports that Nasser’s people were agitating against us in Libya concerning Wheelus Field [a U.S. airbase outside of Tripoli]. The atmosphere was darkening all the time. Dulles did another impulsive thing. Without consulting Bob Murphy, his right-hand man who was Deputy Under Secretary for Political Affairs and who had enjoyed the fullest confidence of the White House, he decided that he was going to withdraw from the high-dam proposal. 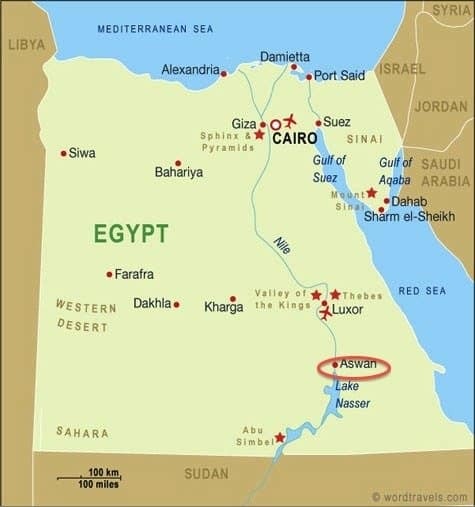 Ahmed Hussein, the ambassador of Egypt to the U.S., was in Egypt at this time. He returned with Nasser’s modified stance on the High Dam package, — what Nasser objected to — but stating that agreement with Nasser was at hand and affirming that matters of only secondary importance were outstanding. Thus Ambassador Hussein gave an interview to the press before he had talked with Dulles. Dulles didn’t like that, either. Hussein then asked to see Dulles. Dulles had his own press notice already prepared. He handed the draft to Bob Murphy for an immediate go-over, and it was the first indication that Bob Murphy had — and he told me this himself, afterwards — that Dulles was going to turn down the American participation in the High Dam. He was going to withdraw. Of course, Ahmed Hussein was crushed. He had been very strong for the American relationship. All his time as ambassador he worked very hard for it. He used to come in and argue with us like blazes about Israel and all those things, but basically you could see that he was hurt. He believed in the American relationship very fully…. Hussein said, “What!” Nasser said, “Yes.” Then somebody burst in on Nasser and Ahmed never had a chance to follow up and obtain from Nasser any elucidation or chance to argue. BOWIE: More and more, Nasser was acting in ways which were seen as damaging on the Western side during the spring of ’56. And finally Congress was becoming more and more hostile to using American funds for this purpose, responding to a variety of pressure groups. Cotton growers in the South thought that this irrigation would increase the amount of long-staple cotton and be damaging to them. Supporters of Israel saw this as building up Nasser. Nasser recognized Communist China in about May or a little earlier and that alienated the China lobby. As I say, there was growing disillusion with Nasser and doubts about the ability to work with him, particularly over the decade, which would be required for construction of the dam, a feeling that if you carried through you might very well have so much friction over handling it and completing it that you not get any political benefit from it but would get hostility. And finally Congress threatened to pass legislation which would have actually forbidden the use of any funds from foreign aid to support the dam. So in the middle of July Dulles finally, in consultation with the British, decided that they would simply withdraw the offer. And this of course was seen by Nasser as highly offensive: he considered it as a reflection, an effort to denigrate him; a week later, he nationalized the Suez Canal Company. CORTADA: The position we took was serious reservations about its economic viability. 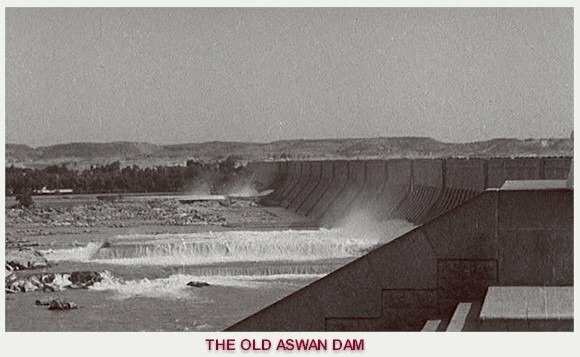 Now, purely as a political measure, the United States, France, and England together persuaded the World Bank to make an offer to finance a beginning stage of the High Aswan Dam. But Nasser was a very devious guy and I seem to recall seeing something to the effect that when he visited Yugoslavia to see Tito, sometime around that period, that he told Tito he was going to nationalize the [Suez] Canal. The breakdown of the High Aswan Dam negotiations merely gave him the excuse to take that step, and how it happened was Dulles’ own fault…. There was an agreement with the World Bank [and Nasser]. It was a document, signed, sealed, and delivered. A copy was in the back of Carr’s safe. It was right there. The Egyptians had to meet certain requirements in terms of allocations of their resources. What happened eventually was that, in my belief, Nasser had no intention of allocating Egyptian resources to the project in collaboration with the World Bank, the United States, France, and England. What he wanted was the Western countries and the World Bank to finance the High Aswan Dam, and get somebody else to finance the industrialization of Egypt, or vice versa. And he knew very well that this wasn’t going to fly. With that deviousness characteristic of his, he set a trap and Dulles fell into it. Nasser instructed his Ambassador in Washington to go to Dulles and demand a yes or no to U.S. commitment for the financing. Dulles, with that arrogance of his, gave him a flat no. This gave Nasser the excuse he wanted to go ahead and nationalize the Canal, and appear before the world as a martyr victim of Western intransigence. It was quite a posture. What Dulles should have done if he had any real diplomatic flair was to have told the Egyptian Ambassador: “You know, this is a very complex matter, maybe there ought to be other ways to do this which would give you more advantage. Let’s meet two weeks from now and talk about this again.” This would have deprived Nasser of an excuse for any action and put the monkey on his back. WILKINS: It was during 1955, you know, when it first became apparent that the Russians were shipping arms, through the Czechs, to the Egyptians. And the Egyptians were paying for it with Egyptian/Sudanese cotton…..Dulles was very much in favor of the Aswan Dam, particularly being prompted by Eugene Black. Black thought it was a great opportunity for the United States and European powers to do something important in Egypt, because of its overpopulation problem, and because of its lack of food…. As the world knows, in the fall of ‘56, when Dulles became aware of the arm shipments to Czechoslovakia to Egypt, he made a statement withdrawing the Aswan Dam offer “for the time being.” This is ignored by American and other historians. But the fact of the matter is that Dulles received information in the form of an amendment, I believe, to one of the appropriation bills, saying that no more aid for Egypt if he went along with the Aswan Dam. Congress was nervous about our spending so much money out there, in the form of aid. This is the real reason that Dulles made that statement. He was prompted by the fact that our relations with Nasser were going from bad to worse…. After that the Russians picked up the deal. Instead of being a $1.3 billion project, it became a $600 million project under the Russians, and had never been extended. As a matter of fact, it’s been a fiasco for them, too, because the Aswan Lake is much longer — it’s 300 miles long — than was expected. It has more evaporation than was expected;…and malaria has returned…. They couldn’t build enough electricity for Egypt. The river below the dam, going into the Mediterranean, is now so clear it has undermined all the bridges and banks, and they’re collapsing. And there are no more shellfish at the mouth of the Nile and the Mediterranean. So…it’s incomprehensible to me that this project could have been staffed-out by the Army Corps of Engineers and other experts beforehand…. So much for the Aswan Dam. I wanted to say this about it, because I want to support Dulles. I think his intentions were correct. He thought it was good for the Egyptian people, but he was blocked by Congress in the long run. And then, of course, he was misled by the British, French, and Israelis in their intervening, and also by the Russians supplying arms to the Czechs through the Egyptians at that point. MCDONALD: [I was reporting on the Aswan Dam’s] progress of construction. They had the wrong design but they still did a magnificent job when it came to actually doing it. What they decided to do was basically to build an earth dam to block the Nile with earth. What they had to do then was dig an enormous canal out of the hardest granite in the world, for the Nile to pass through and around the dam itself, as opposed to having sluices through the dam as the U.S. had designed it to do. So what they had to do was to dynamite this enormous gorge which the Nile was going to go through, which was a considerable length. And they found, and this was an anomaly, as you can imagine, at the height of the Cold War, that they needed U.S. equipment. The Soviet equipment, particularly the trucks, enormous earth moving trucks, and particularly the drilling equipment and the drills. Their drills were not tough enough to get through that granite in which to put [the] explosives. So they had to arrange through us a negotiation to purchase American trucks and American drilling equipment. Which is a great loss of face to the Soviets right in the eyes of the Egyptians, but it just didn’t work, their drills would break off because they weren’t hardened steel…. It got pretty hot there. They worked around the clock, seven days a week, all year round. It would get up to 130 degrees in the day and so they wouldn’t work in that kind of heat, but they would work nights so they had enormous searchlights all over, which made it like daylight. They had housing problems of all kinds. They had maybe 30,000 people working on that project, and they had to resettle people. It was a very complex, sophisticated project and I would go down there every three months or so and just report on what was happening and how they were getting along and what their problems were. In 1400 B.C., the first peace treaty was signed in history. This was between the Hittites of Turkey, and the Egyptians. They signed it in what is now Syria. They had battled on the plains of Syria and they’d come to a standstill, basically, so they decided to have a peace treaty, in which they both agreed to make peace and go back. It was clear there was no victory on either side. In my archaeological experience I went to Brazgoy, which was the capital of the Hittite Empire in 2000 B.C. and beyond. There was an enormous monument, or what was left of it, that had been built to honor the Hittite victory over the Egyptians, in spite of the peace treaty which had been signed. And then in my Cairo experience I got down to Abu Simbel and that was a great monument built by Rameses II to honor the Egyptian victory over the Hittites! So the first treaty was signed and they went back and built monuments in their respective countries honoring their victory. So that’s how peace was determined in those days. But UNESCO did a magnificent job of cutting up the monument piece by piece and then rebuilding it higher up so that you can still visit it there now after the dammed lake had been filled. But [the dam] has had major ecological difficulties for downstream because the silt has not gone through and the fish…major difficulties, as predicted.